Before the settlers arrived, the big swamp about 30 miles east of the future site of the City of Columbus was filled with a variety of wetland plant and animal life. 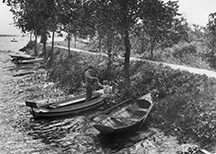 Soon after the settlers began to arrive in the early 1800’s, they began constructing canals for transporting their products to market. Canals needed water storage reservoirs and the big swamp provided a site. So embankments were built to hold the water which became known as the Licking Reservoir. The canals and their adjacent tow paths were constructed, entering from the north at Sellers Point and extending both to the east, along the north bank to Thornport, and to the southwest through Millersport. However, as the railroads began replacing canals, the Licking Reservoir deteriorated. About 1876, the first railroad came to the Licking Reservoir, bringing ever-increasing numbers of fishermen. 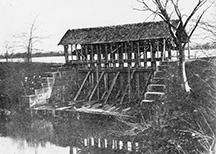 In the mid-1890’s, the last canal boat passed through and, sensing the change, the state legislature reserved the Licking Reservoir as a public park to be known as Buckeye Lake, thanks in large part to the efforts of George H. Watkins, former canal superintendent and new president of the State Board of Public Works. Minor improvements were made without significantly lowering the waters. Considerable areas had been cleared of dead and live vegetation down to various water levels, channels formed and some fair-sized basins were created, interspersed among large island-like, still unmappable, areas which made these areas somewhat safer for boating, especially during high water. To some, the arrival of Dell Fisher’s steamboats in 1896 and then the new-fangled, noisy, little “stinkpots,” moving faster than a buggy horse can trot, were a desecration of this long-time fisherman’s paradise. There were also a variety of people in boats with sails. 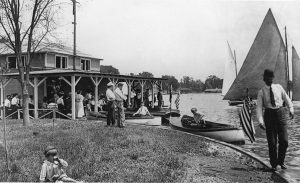 On April 24, 1906, about forty, out of the hundred or so people who were invited, met in Columbus to form an as yet unnamed yacht club at Buckeye Lake. The next day, all of the Columbus papers announced that yachtsmen were meeting to form a club. 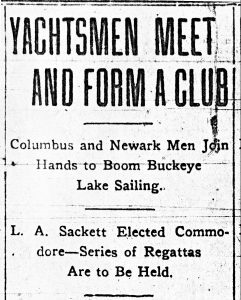 Recognizing the long-standing rivalry between the cities of Toledo and Columbus, two days later the Toledo press reported that the formation of a yacht club in the Columbus area would permit competition to extend to the sport of yachting. They reported that the members of the Toledo Yacht Club would ship water to the capital city during the late summer months so that the yachtsmen could continue their sport. 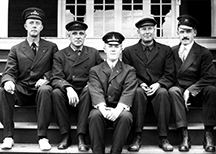 In preparation for the meeting, the leaders had contacted a past commodore of the Maumee River Yacht Club, who sent them copies of his club’s constitution and by-laws and an Inter-Lake Yachting Association “Manual.” The group elected officers and a board and formed a committee to draft a constitution and by-laws and another one to propose a club name and design a flag. Fifteen of the forty who attended participated in organizing the club. Eleven days later, Sunday, May 6, 11:00 a.m., on Orchard Island, the first club meeting took place. In the interim eleven days, the original fifteen sought to increase membership. They prepared news releases announcing the meeting, and made arrangements for transportation of food and refreshments for the expected crowd on Orchard Island. By meeting day, May 6, the club membership had grown to forty and, aboard members’ boats, about sixty members and prospects found their way to Orchard Island. At the meeting, a constitution and by-laws were adopted, including the new club name, “Buckeye Lake Yacht Club.” A club flag and emblem were adopted, but a few years later new ones were adopted along more traditional designs. Only boat owners were eligible to be flag officers. Annual dues were $4.00 and the initiation fee was $2.00. With the formation of the new club, the term Licking Reservoir was soon replaced with the name Buckeye Lake. July 4, 1906 at the Lake Tourist Hotel – Shell Beach? 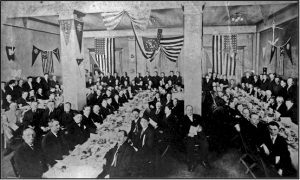 On Memorial Day, 1906, BLYC held its first event. Columbus participants arose at 7:00 to catch the interurban, arriving at the lake at 8:30. They were ferried over to Orchard Island and readied the boats for the day’s activities. 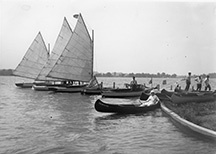 At 9:30 a.m., most of the club’s forty craft, gaily decorated with flags and bunting, loaded to gunwales with members, relatives, and guests in holiday attire and spirits, moved in line around the middle basin of Buckeye Lake with power boats pulling sailboats, leaving Orchard Island nearly deserted. Fanfare of gunfire from one of the leading boats announced their progress. A surprising number of spectators were attracted to the water’s edge. After the parade was over, participants and spectators on the island and the main shores were alerted to the beginning of a race by periodic cannon fire. With a smoke belch from the muzzle in the last of such blasts, twenty-three of the club’s thirty-four one-lunged, torpedo-type, Mullin steel boats, and others of a similar nature, started across the starting line. It was a free-for-all over a two-mile course to aid in determining handicaps for subsequent races. Only boats finishing this race would qualify for entrance in the main power event to follow, and less than half finished. The main cup race for power craft started nearly an hour late, due chiefly to handicapping computations. Eleven boats took to the course, westward from Orchard Island. The first boat made it in 59 minutes and 47 seconds. The “Sail Yacht Race” started at 3:20. Guns again announced the beginning of the race. The wind freshened. One crew fell over and amid shouts from the island and the main shores managed to scramble aboard again. Then, a mast snapped and one boats of the six starting sailboats was out of the race. Another turned over, her skipper resting on the centerboard until a club powerboat came to the rescue. A third boat, manned by three sailors, appeared to be weathering the young gale without difficulty when the main sheet fouled and wouldn’t come free under a knock down, and over she went. A schooner, sailed by a crew from Buckeye Boat Club, reconsidered the weather and pulled out of the race at the end of the first lap. The three remaining contestants all won trophies. 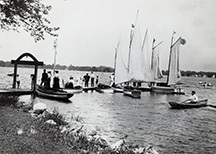 On July 17, 1906, state officials, including George H. Watkins, President of the Board of Public Works, escorted by the Commodore and Secretary of BLYC and others, arrived to inspect the lake. As a result of their visit, an oil well proposal was rejected and effective temporary repairs were made to the locks, waste-weir, and at critical places along the embankment to retard lowering of the lake’s level in the late summer. Further “great improvements” were publicly promised by the state authorities. By September of 1906, there were forty-nine members from Columbus, twenty-six from Newark, and eight from the surrounding area. Forty eight members owned one or more, or were part owners of, forty-nine boats; thirty-four power and fifteen sail. In December, 1906, a group from BLYC barged in on the fall meeting of the Inter-Lake Yachting Association in Toledo applying for membership of BLYC in that organization of big water sailors. While personally met with every collegiality, this unprecedented proposal on the part of a bunch of homeless, inland “stump skippers” was greeted less enthusiastically. Since its organization in the early 1890’s, the I-LYA’s established rule had been never to take in a club from off its wide open and connected waters. While they admired BLYC’s enthusiasm and its ambitions, under that rule BLYC was not eligible. At that point, I-LYA’s good old commodore George Worthington of Cleveland Yachting Club arose to defend the upstart club’s proposal. On a map of Ohio, he pointed out how Buckeye Lake was connected to Lake Erie at his own home town, Cleveland, by way of the Ohio and Erie Canal. That ended the controversy. Buckeye Lake Yacht Club was admitted as a full-fledged member and BLYC’s commodore was invited to represent the club on the I-LYA Board of Directors, the first “inland club” so honored. Holding the first of several “Tar Socials,” the club members set about increasing club interest and membership, organizing opposition to poaching on the lake and erecting a clubhouse. At the first Tar Social, following “plenty to eat and drink,” the group was addressed by some of the club’s own orators and several “visiting boatmen,” including the secretary of the Toledo Yacht Club, from Detroit, the editor of For ‘N’ Aft, showing lantern slides of various styles of boats and boathouses, the commodore of the Maumee River Yacht Club, and a representative of Boating from Cleveland. Subscription paper was circulated to sell stock in a club house at $5.00 a share. The Buckeye Lake Building Company, a corporation for profit, was formed with 5,000 shares at $5.00 each, authorized for the purpose of constructing a clubhouse in the vicinity of Buckeye Lake. In January 1907, the incorporators took over a lease on an island just west of the “flats” (probably the Dye/Hein cottage) and on a half lot on the lake’s main shore facing the island. The island, then known as “Sunken Island,” was a spot of sometimes, land, bearing several half-grown trees, mostly willows, surrounded by always shallow water and, in the spring season, frequently flooded completely. But, they saw that it had possibilities because it could be deepened by scraping onto it materials from the bottom. It sat at mid-lake and would afford desirable privacy and an unobstructed view in all directions of the lake. Also, it was located near a wagon road and only 300 yards from the inter-urban railways lake terminal and therefore, would be conveniently accessible, especially with a foot bridge that could span the strip of swampy channel separating the island from the lake’s north embankment. Preliminary sketches and grand plans were drawn for a very beautiful two-story clubhouse. five contractors bid on the project and all were rejected because it was considerably more cost than could be afforded. Consequently a committee was created to secure new ids at a considerably lower cost. this boathouse and club room were completed in November 1907. In the following year, a porch was built across the lakeward end. Pictures of this structure are hanging at the yacht club today. Membership exceeded one hundred.